When President Barack Obama named Senator John Kerry as his Secretary of State, he opened the door for a new chair to assume control of the Senate Foreign Relations Committee: New Jersey’s Democratic Senator Robert Menendez. Menendez (at right) replaced Senator Kerry as chairman on February 1, 2013. On March 5, the new chairman spoke to the annual AIPAC policy council in Washington. He is keeping that promise. This week, speaking with the “power” of his office, he took a strong position against President Obama’s effort to reach a nuclear agreement with Iran. When word went out from Israeli Prime Minister Benjamin Netanyahu to the U.S. Congress, that this was the time to stand with Israel, Senator Menendez was ready with his op-ed. In demeaning Iran’s “so-called charm offensive”, the Senator used a phrase initially voiced by Benjamin Netanyahu. A so-called Iranian charm offensive is simultaneously matched by an actual offensive to cross the nuclear weapons threshold. It is incompatible for Iran to pursue true diplomacy while installing any new centrifuges, including advanced centrifuge technology, and developing a heavy water reactor in Arak in defiance of the international community, most vocally this weekend by France. This week on the eve of another round of talks with Iran and the five permanent members of the UN Security Council, Britain, China, France, Russia and the US, plus Germany, Senator Menendez chose sides. “The US Congress has recently been seeking to approve a bill to increase sanctions against Iran. It has been decided that the negotiations be suspended if the bill gets through the US Congress,” said Mohammad Hassan Asafari who sits on the National Security and Foreign Policy Committee of Majlis. The Iranian lawmaker made the remarks after a meeting in which Iran’s nuclear negotiating team briefed the parliamentary committee on two rounds of nuclear talks with the [P5 plus one] nations. The US Senate Banking Committee is mulling over whether to move ahead with a new anti-Iran sanctions bill it had delayed before the latest round of talks between Iran and the group of six world powers which was held in the Swiss city of Geneva on November 7-10. Senator Menendez’s work in the Senate parallels the issues of concern of the American Jewish community. Menendez recognizes the political, economic, and strategic significance of the US-Israeli alliance, and has been vocal in his support of the relationship. He is truly a friend to Israel and New Jersey’s Jews.
. . . it’s an unarguable fact that sanctions on Iran’s oil sales and financial system, imposed by the European Union as well as Congress, have forced the Iranians to take the nuclear negotiations more seriously than they have in the past, and may even have helped elect the moderate president Hassan Rouhani. So why is the White House insisting that Menendez and his colleagues on the left and right are provoking “a march to war”? The obvious answer, furnished by Secretary of State John Kerry, among others, is that Iran would view additional sanctions imposed in the middle of the most delicate negotiations as a sign of bad faith. More to the point, a punitive response by the West would undermine the moderates on Rouhani’s team, and prove to Iranian hard-liners — including the supreme leader, Ayatollah Khamenei — that the United States and its allies are an intransigent adversary intent on humiliating Iran and ultimately overthrowing its Islamic regime. . . .. 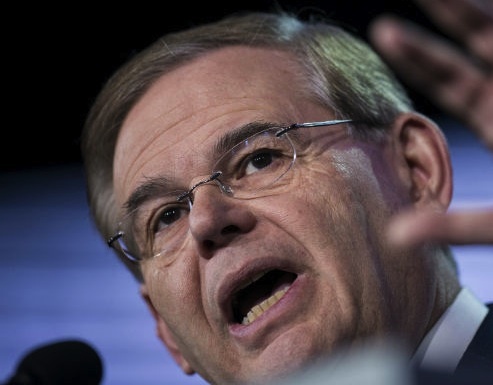 The reason why Menendez and others really are marching on a path to war is that they are demanding an outcome which Iran manifestly will not accept: zero enrichment. The most notable flash point between the US and Israel is quite obviously Iran. Since taking office, President Obama has sought a deal to end Iran’s efforts to build a nuclear weapons. While this is clearly in Israel’s interest, it’s the outlines of a possible agreement that is the problem. The Israeli position of no uranium enrichment, even for peaceful purposes, the removal of all enriched uranium from Iran and the shutting down of all enrichment facilities is a negotiation non-starter – and stands in sharp contrast to the US position. . . Netanyahu appears focused on trying to torpedo any chance of an agreement, altogether. This is a dangerous game that if successful would not only create a fundamental breach between the US and Israel, but would almost certainly increase the likelihood of Iran actually getting a clear nuclear capability. By choosing Israel’s side in these negotiations, Senator Menendez accepts Israel’s negotiating methodology: Make impossible demands to guarantee that no agreement is possible. This is the same method Israel uses in the second “flash point” that Michael Cohen identifies in his Guardian column, the Palestinian-Israeli peace talks. Israel has participated for decades in these talks while stealing Palestinian land and tightening its control of the Palestinian population. The “impossible scenario” is Israel’s modus operandi. Will it work with Iran? Senator Menendez must believe it will. Act Blue assures us Senator Menendez “is truly a friend to Israel”. Is promoting war with Iran a friendly act? Maybe it is time for Act Blue to tell the Senator that “friends don’t let friends drive drunk”. — Zionist Israel has a vast arsenal of nuclear WMD (google Mordechai Vanunu, for starters) — not to mention biological and chemical WMDs. There is good visual as well as medical evidence that Zionist Israel has repeatedly used its chemical WMD on the hapless Palestinians. –The U.S. entire (16-agency) intelligence community has stated — and then re-stated — that Iran is NOT pursuing nuclear weapons. Menendez and his ilk are idiots, a pack of dogs chasing the wrong fox. Very disheartening indeed. We need to call his office and leave a message that being in the pocket of AIPAC, and doing the bidding of another nation as a US Senator is not acceptable. The American people don’t want more sanctions on Iran or another mideast war. We need to tell our own Senators the same thing. We need to swamp them with calls, emails letters and visits. If history is so important — and I have no doubt it is –, how have we overlooked the reality that, when the State of Israel was established by intervention of American power, Palestine had been an Arab country for almost 1900 years? How can we ignore the truth that the Arabs are descendants of Abraham as much as the Jews? And how can be ignore the reality that the State of Israel was established in defiance of the British White Paper of 1939 which defined the practical meaning of the Balfour Declaration of 1917? Palestine belongs to both Arabs and Jews who are both Semitic peoples, so it cannot be anti-Semitic to favor peace between them instead of excluding one or the other from the Holy Land. .
As for the Bible, Daniel’s 70th week was a week of days which began with the entry of Jesus of Nazareth in fulfillment of Zechariah 9:9. Our duty in the Bible is laid down in the first chapter of Isaiah, which says that our duty is to seek justice, not to make sacrifice. .
John Kerry was right in his interview of the 7th of November, 2013. And his diplomacy with Iran is also right. Menendez was an obvious mistake. Thanks for your usual thorough analysis. Shared this Facebook, hoping a few more people will become aware. Thanks, Jim, for an excellent analysis, indeed. Obviously, Netanyahu is deploying a most typical Israeli strategy of aggressive “Offensive” plan – as in, “Offense makes the best defense” – in order to extract unreasonable conditions at the expense of American and Western interests, as well as the entire world economy. It seems to me that an effective way to foil Israel’s offensive against America, and against peace, is to launch a counter-campaign that exposes Israel’s nuclear arsenal and reveals Israel’s ulterior motive to maintain its nuclear monopoly and colonial hegemony in the Middle East, particularly in the Gulf. The world has an obligation to stop this Netan “Yahu–gone-mad”, before America has to deal with, yet, another major contrived war in the Middle East. This sadistic treatment of Iran, a nation which has never threatened us, is inexcusable. I hope some psople who make our foreign policy will come to understanding thr trith–Israel is trying to use our resources for its plan to take over the whole middle east.